The mission of APTP is similar to Common Wealth’s and National Theatre Wales and is built on a mission to inspire young people through art to create social change. If I was to create a youth theatre this would be what I’d model it on. It’s the most holistic approach to running an organization I’ve ever seen. The doors are always open, kids hang out in the workshop space playing ball and listening to music. These young people recruited from local schools are welcome to come here anytime. The kitchen is full of food, snacks, drinks, healthy and some treats. They spend $50,000 a year on stocking the kitchen – the kids come and help themselves to what they need. After rehearsals/ workshops the young people are offered free tutoring and support. When the session starts it’s amazing theres so much fire in the room – and power. When the APTP facilitators pass on the baton the young people run with it, catching rhythms, beats and words and transforming them into their own. We introduce the young people to the mega ambitious idea thats been forming over the past 9 months one that has began to respond to the growing isolationism that we see creeping through the world. As artists we want to make sense of the drastic changing landscape we find ourselves in – the landscape that our young people will one day inherit. The young people that join us are charged – their faces tell a thousand stories they resemble the iconic political heroes of Chicago’s radical past. They talk with wisdom about their changing landscape, gentrification, gun crime ad immigration. Its real for them. Between the heavy seriousness of making sense of it all we find moments of laughter and solidarity. We share stories from the UK, dance to grime and tell jokes. We reflect on our names the stories behind them. 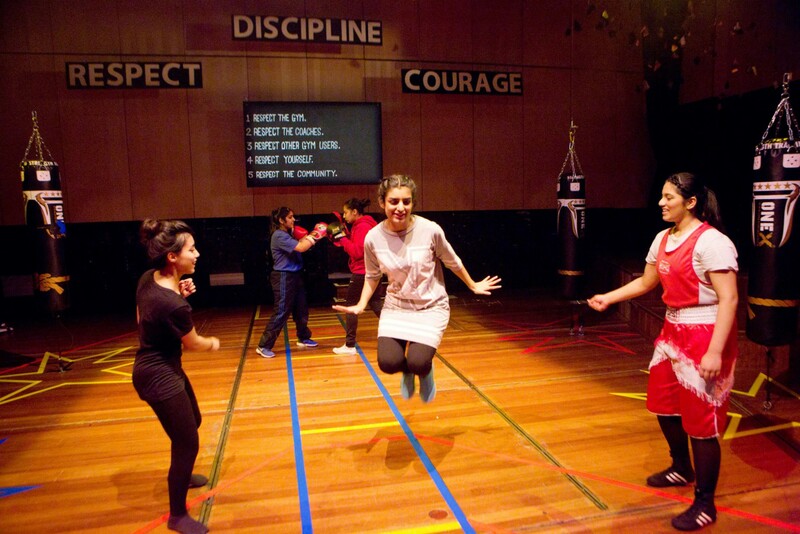 We hear stories of being named after mothers, fathers, songs and messiahs – I learnt this exercise off Clean Break a theatre company in the UK who work in women’s prisons. Its one that reminds us that we all have a story, a name – that can’t be taken away. We write our names on the wall – and each time someone joins us we add more to this homage to those in the room embarking on this crazy adventure with us. Exploring what it means to take our place in the World I tell them about a guy I once met who’s mission in life was to get people to feel confident in taking there place in front of people. I told them stories of mum’s who would never make birthday cakes for the fear of having to hold the cake when the candles were getting blown out – fiancés who’d never proposed because they were scared of standing in front of an audience on their wedding day. The things that hold us back and how we should confront them. In response to these stories we practice what it means to look at each other and what it feels like to truly be seen. Standing in front of an audience one at a time we describe what it feels like to be watched by an audience, sweaty palms, racing heart, turning belly. Through all the fear we do it – we stand through all the applause and at the end we have a round of words from the young people. Safe, inspired, strong, curious, proud – are some of what we here. A brave find on day one.